George Stevenson (1820-1904) was born in Loughborough, the son of a Baptist Minister, and came to Leicester in 1845 where he set up a solicitor’s practice in New Street. A Liberal, a Nonconformist, and a magistrate, he served on the Borough’s Museum Committee. 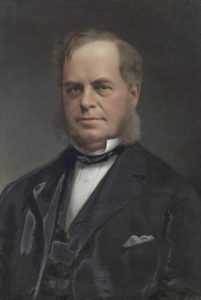 Within the Lit and Phil he was Secretary or Joint Secretary from 1845 to 1851 and President in 1879-80. In 1869 he was elected Mayor, and at a meeting of “The Club” that year described with excitement his attendance at the Lord Mayor of London’s splendid banquet for the King of the Belgians. It was due solely to his tireless endeavour that Leicester’s Free Library was established, for although the Council had resolved to establish one in 1862, it was only through the persistent efforts of Alderman Stevenson that nine years later it finally acquired the old Mechanics’ Institute in Belvoir Street to serve as the town’s first Free Library. It housed trade, reference and local history books, a lending department with over 16,700 volumes, a section for periodicals, and a railed off area for ladies. After his enduring battle was won, Stevenson served as Chairman of the Library Committee for twenty years, and on his death it was remarked that ‘his name deserves to be bracketed with those of Wyggeston and Newton, as the local heroes of education’. Stevenson was also involved with the new church on the corner of Victoria (now University) Road, that opened in 1867 and which was to cater for a newly prosperous congregation on the south side of town. Although originally associated with Archdeacon Lane Chapel, where he founded the Sunday School, Stevenson subsequently became a Sunday School teacher at Victoria Road. He was also President of the Leicestershire Sunday School Union, promoting its libraries and issues of free Sunday School books. Stevenson was himself a published author, writing on literature, drama and libraries. He was also a keen collector of art and when meeting at his home, Club members admired ‘our host’s latest purchase, a wonderfully spirited sketch by David Cox of ‘Children in a Hayfield’.’ It was at Stevenson’s supper in de Montfort Square in May 1860 that the idea of The Club was first mooted. Popular with all, he ‘had a genial face and fine countenance, and was held in high esteem and respect by all who knew him’. Source: Caroline Wessel, 2010. The Club. pp.85-96 in Exchanging Ideas Dispassionately and without Animosity (Leicester). See also Simmons, J., 1971. Life in Victorian Leicester. (Leicester), p.70. and Rimmington, G., 1997. Victoria Road Church, Leicester: a Victorian Experience in Ecumenicity. Trans. LAHS, vol. 71, pp.72-85.